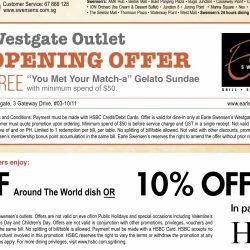 Exclusively for HSBC cardmembers, enjoy a FREE "You Met Your Match-a" Gelato Sundae with a minimum spend of $50 at Swensen's new Westgate outlet! Or get a $10 return voucher when you spend a minimum of $60 at all other outlets except for Bukit Panjang Plaza, City Square Mall & Earle Swensen's VivoCity and Westgate from now till 30 August 2016! 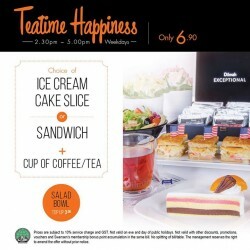 Teatime Happiness! Come on down at Earle Swensen's outlet during 2:30pm to 5pm on weekdays to enjoy a choice of ice cream cake slice or sandwich plus a cup of coffee/tea at only $6.90! Top up an additional $3 to enjoy a bowl of salad from our range of salad bar. See you soon!